For the job you want (or whatever). The Crosby Blazer is the ideal fusion of uptown class and downtown cool. Featuring luxe tweed and hand-frayed edges, you’ll wear this just as well with a LBD as a pair of ripped jeans. Made in NYC. Will ship in 1-2 weeks. Loose fit for easy layering. Slight contouring at waist. Hemline hits at the hip. Our model is 5'10" and wearing a size 2. 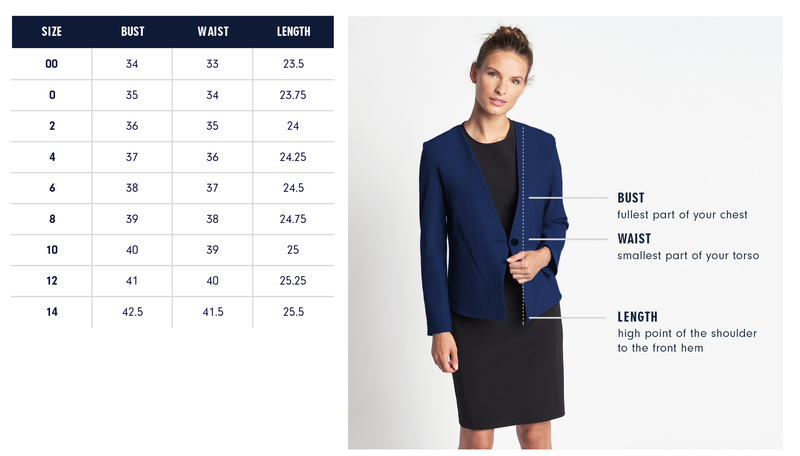 Below are the exact measurements of the Crosby Blazer. All measurements are in inches. For general brand fit, sizing, and measurements, please visit our Brand Fit & Size Guide. Care: Machine wash warm; line dry. Do not tumble dry. Dry clean. Loose fit for easy layering. Slight contouring at waist. Hemline hits at the hip. I love the fringe detail on this blazer. It's the perfect accent to the clean silhouette.